With the start of school and the change from summer to fall, you know what comes next—the dreaded cold and flu season. It’s only a matter of time before someone in your family comes down with the sniffles, a scratchy throat, or a cough. 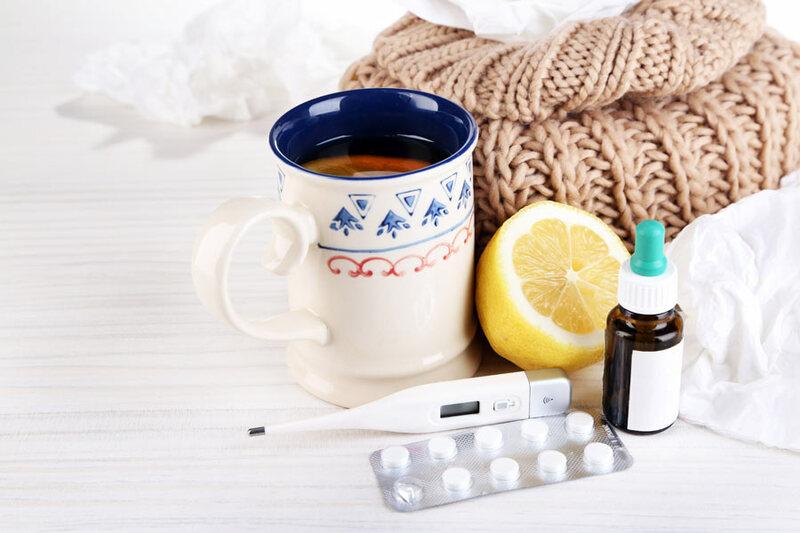 Whether you’re dealing with an upper respiratory head cold or a lower respiratory chest cough, you’ll want to support your immune system the best you can. Here’s how. If a family member has already come down with a cold or flu, you’ll want to do everything you can to avoid catching it. Viruses and bacteria have what’s called an incubation period—that’s how long it takes between the time the bug enters the body and the time you start to feel sick. For most cold and flu bugs, that can take up to a few days. But even if you have already started to feel symptoms, you may still be able to shorten the duration of your illness by taking a few steps. First thing’s first, you’ll need nourishment. At the first sign of illness, pull out your stockpot and make some good old-fashioned chicken soup. Forget the noodles—just cook up a broth of chicken and vegetables. And if making your own soup isn’t feasible, find a local restaurant that makes homemade chicken vegetable soup and buy a big container to take home. Eat it daily. Our mothers knew what they were doing when they served us chicken soup when we were sick. It works. If you have come down with a cold within the last 24 hours, oral zinc—lozenges, tablets, or syrup—may help reduce the length of your cold. Let the zinc coat the back of your throat. Zinc only needs to be taken for the duration of the cold, and shouldn’t be taken with antibiotics. If you have already come down with the flu but you haven’t had symptoms for more than two days, elderberry extract may help shorten the duration and lessen the severity of your illness. Sambucol is the elderberry extract that has been shown to be effective in clinical trials. They make a children’s syrup, too. For a cough, Planetary Herbals Loquat Respiratory Syrup is recommended because it contains loquat leaves, which Traditional Chinese herbalists have used to support respiratory health since at least 500 AD. They also have a syrup for children. For overall wellness, Source Naturals Wellness Formulas—for adults and children—can be taken at the very first signs of imbalances in your well-being. These formulas contain vitamins, minerals, and herbs that support immune health. Another multi-ingredient formula you might like to try is Buried Treasure’s ACF. It combines vitamin C, zinc, elderberry extract, Echinacea, osha root, and more into one formula. I also love Redd Remedies’ formulas. They have a few sinus and respiratory support formulas for adults and children that are great. Their Lung Care and Sinus Travel Diffusers are great if you plan to travel this fall. Click https://reddremedies.com/find-a-store/pbs-manufacturers-coupon-2016/ for a discount coupon. Preventing a cold or flu is the ultimate goal, but it takes more than just supplements to ward off illness. A healthy diet is the foundation for a healthy body. If you’re already eating plenty of fruits and vegetables, cutting out sugar and starchy foods, eating healthy proteins and beneficial fats, getting plenty of sleep, managing stress, and exercising, you’ve done most of the work. Keep it up. I do recommend daily probiotics to help keep your immune system functioning at its best. Some studies have even found probiotics to help prevent colds when taken daily. If your immune cabinet isn’t ready for cold and flu season, now is the time to prepare. Fill it with the products I’ve recommended and you’ll be ready for a healthy season.